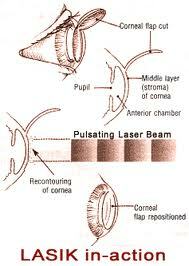 LASIK or laser assisted in situ keratomileusis is a flap-based laser refractive surgery procedure. Laser refractive surgery in general can be subdivided into flap procedures and surface-based procedures. In flap procedures, a blade or laser is used to cut a thin flap from the corneal stroma. This corneal stromal flap remains attached to the rest of the cornea by means of a small hinge. The flap is then lifted to allow the excimer laser to cut and remodel the corneal tissue underneath. Once the remodeling is complete, the stromal flap is repositioned at its original position. The excimer laser reshapes the cornea in such a way that light entering the eye can be focused uniformly onto the retina. If you have myopia (nearsightedness), your cornea is considered too steep and is therefore flattened with the excimer laser. The converse is true for hyperopia (farsightedness), where the excimer laser will steepen your cornea. The cornea consists of 5 layers - the epithelium (outermost layer or 'skin' of the cornea), Bowman's membrane, the stroma (thickest central layer of the cornea), Descemet's membrane, and the endothelium (innermost layer of the cornea). In LASIK, the corneal stroma is cut with either a femtosecond laser (IntraLase) or a microkeratome blade to create a circular flap that is around 100 - 180 micrometers thick. A suction ring keeps the eye still and prevents inadvertent movement. 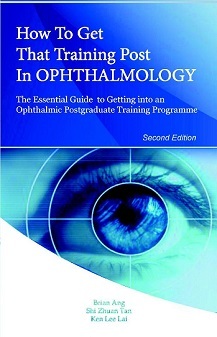 The flap is lifted like a hinged door, thus exposing the underlying corneal tissue. After the underlying corneal tissue is ablated with the excimer laser, the stromal flap is replaced at its original position. No sutures are used. The internal healing process slowly fixes the flap at this position over several months. Corneal striae or wrinkling of the corneal flap. Corneal striae can occur if the flap is not created or positioned properly, and is either too thick or too thin or irregular. 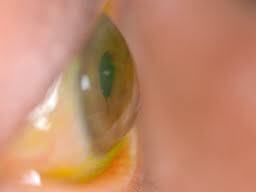 The symptoms from corneal striae depend on the severity. Severe cases can result in significantly reduced and distorted vision. To correct this, the old stromal flap may need to be stretched and ironed out, or a new flap may have to be created. At first glance, the eye above looks normal. But on closer inspection, you will see almost vertical straight lines within the corneal stroma. These lines are caused by wrinkling of the LASIK flap and are called corneal striae. Irregular astigmatism resulting in an irregular shape of the cornea. Irregular astigmatism typically occurs when the corneal flap is not made correctly or when the laser ablation was not centered properly on the eye. If you develop irregular astigmatism after LASIK, you may experience double vision, glare, haloes and ghost images. Often, enhancement or retreatment will be required to correct this problem. Diffuse lamellar keratitis or inflammation under the flap. It is a rare, non-infective inflammation that occurs in around 1 every 500 cases. It is still not entirely clear why the inflammation occurs. What is clear is that when too much inflammation occurs between the flap and the main corneal bed, this impairs the healing process. Your eye may feel gritty and sore, and your vision may seem hazy. The treatment for this is steroid anti-inflammatory and antibiotic eye drops. Occasionally, the flap may have to be lifted to wash out any underlying material that is causing the inflamation and disrupting the healing process. The hallmark of diffuse lamellar keratitis is the grainy appearance of the cornea under the flap. When viewed through the slitlamp microscope, it looks like waves of sand inside the cornea. This appearance is also known as the 'Sands of the Sahara'. It is typically noted the day after LASIK. Keratectasia / corneal ectasia is the excessive thinning and bulging of the cornea. It occurs when too much corneal tissue has been removed by the excimer laser. The remaining untouched underlying corneal tissue is unable to maintain the integrity of the cornea, and the cornea bulges outwards. This condition cannot be treated with more laser because laser will thin and weaken the cornea further. It is best treated with contact lenses initially. Rigid gas permeable contact lenses will be needed for more severe cases. 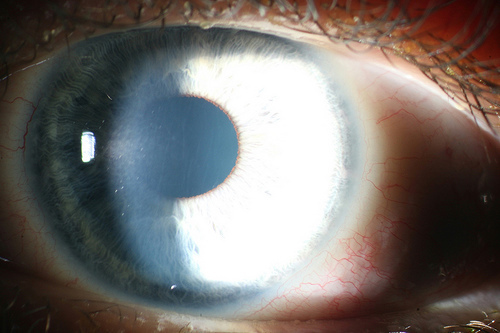 Corneal implants may also be able to keep the corneal shape and position. In advanced corneal ectasia, a corneal transplant may eventually be required. 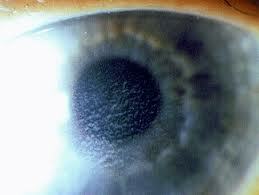 In keratectasia, the cornea thins excessively and this results in the bulging forward of the cornea. This disrupts the way light rays become focused onto the retina, causing blurry and distorted vision. The thin cornea also means that there is an increased risk of serious injury from eye trauma, even if the trauma was relatively mild. These are the main complications which may occur due to the creation of the corneal stromal flap in LASIK. However, there are other potential complications that can occur regardless of whether or not the laser refractive surgery was flap-based or surface-based, such as infection and dry eyes. To reduce the risk of such complications, always follow the instructions given for your postoperative care.